TunesKit DRM M4V Converter (Mac & Windows) is an ultimate solution developed to free iTunes movie users from the restriction of Apple’s FairPlay DRM copy protection by cracking the DRM lock from both rented and purchased iTunes movies and TV episodes. Since DRM has prevented iTunes users from watching iTunes videos on non-Apple devices, TunesKit will help them easily remove DRM from iTunes movies while converting the protected .m4v format to universal MP4 at 20x faster speed with 100% quality preserved. TunesKit DRM M4V to MP4 Converter has all the features that promise a hassle-free iTunes DRM removing experience. So you are suggested to give TunesKit a try whenever you need to watch iTunes movies on non-Apple devices and platforms. You will not probably be disappointed on it. 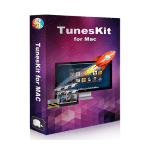 In general, TunesKit iTunes DRM M4V Converter is available in both Mac and Windows OS. It’s specially developed to take off DRM FairPlay from iTunes movies and TV shows by converting the DRM-ed M4V files to common MP4 format supported by most popular media devices. By using TunesKit M4V Converter, you can freely enjoy any protected iTunes movie or TV series on mobile devices, including Android phones, tablets, Windows phones, VLC media player, video editing software, smart TVs, etc. Above all, TunesKit DRM M4V Converter is a user-friendly iTunes DRM remover set to be handled easily for anyone. With a well-designed user interface, the whole DRM removing process only completes in a few clicks. You only need to add the iTunes movies to the converter and it will start to remove DRM and convert M4V to MP4 automatically. Besides, it will also allow you to select output settings, such as output folder, audio tracks, subtitles before conversion according to your needs. The best thing among all the features of TunesKit is its super fast speed and high performance. By adopting an advanced DRM decrypting core, TunesKit iTunes M4V Video Converter is able to work at 20x faster in converting iTunes M4V to MP4. That’s to say, it will only take 3 minutes or around to convert a movie in 1-hour length. What’s more, the super fast processing speed doesn’t affect the output quality of the DRM-free videos. You can get a high quality video without DRM under the help of this smart and professional iTunes DRM removal software. More to that, you just need to purchase TunesKit DRM Video Converter only once and you will be privileged to enjoy all following upgrades for free. That means if any changes came to the iTunes or computer system in the future, this software will still be able to do its work well with those updates. One more thing, if you are not sure whether TunesKit M4V Converter meets your needs in removing iTunes DRM and converting DRM M4V to MP4, you are suggested to try this software by yourself before buying it. TunesKit DRM M4V Video Converter is fair program and performed solidly based on repeated tests and coped with everything that was thrown at it. It does an excellent job of removing DRM lock from iTunes videos and converting the M4V to MP4 without quality loss. It’s worth of trying. 5 Top Lightroom Alternatives for those tired of annual subscription charges. How To Edit Your Photos While Travelling?